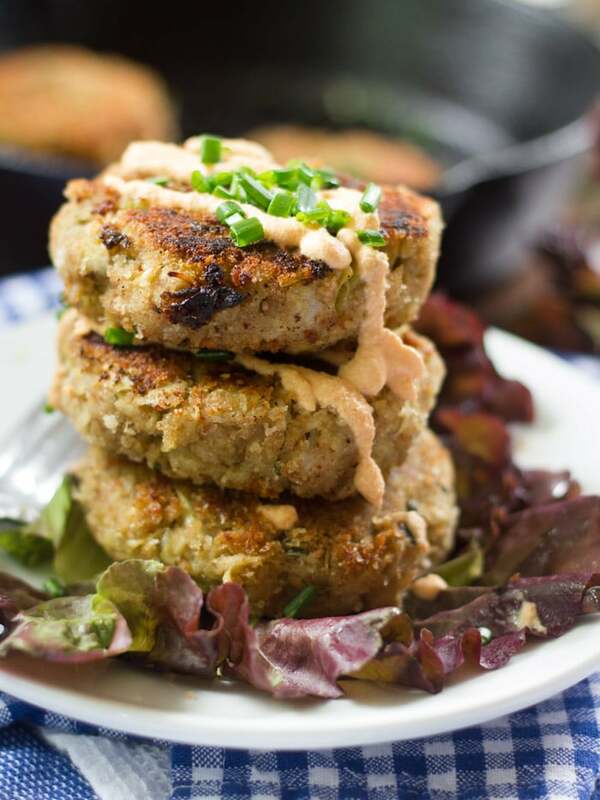 These melt-in-your-mouth vegan crab cakes are made with seasoned artichoke heart patties coated with crispy panko breadcrumbs, pan-fried until crisp, and served with spicy cashew-sriracha aioli! I waited tables through college, and during that time I served up a lot of crab cakes. I noticed one thing: people really love crab cakes. I hope you guys love them, or at least vegan ones. I just discovered that I happen to love vegan crab cakes. Never tried the real deal, but I they can’t possibly be any better than these suckers. I’ve had these on my list of recipes to work on for a while, and you know what? I was shocked at how good they turned out. Also shocked at how simple they were to throw together. I knew artichoke hearts would make a great vegan stand-in for crab, but I had it in my head that I’d have to throw in some beany-type thing to get the cakes to hold together. I decided to throw caution to the wind and give these a go without beans, and they turned out perfect. 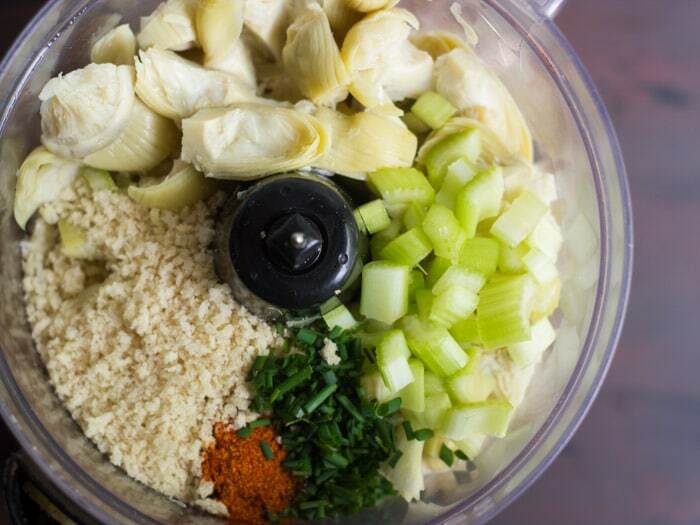 You’ll be lightly blending the artichoke hearts in a food processor with some celery, panko breadcrumbs, and a bunch of seasonings. The key is to not overblend the mixture. You want to keep some texture! Shape the mixture into patties, much like you’d do if you were making veggie burgers. Coat the patties in some more panko breadcrumbs, then pan-fry them to a golden crisp. I’m not sure if crab cakes are intended to be a summery thing, but being cooked up on the stovetop and eaten atop a big old lettuce leaf, they just work for days like today, when, at least where I live, it’s pretty nasty hot and humid outside. I didn’t make these today (which is kind of obvious, as it’s not even 10am as I post this), but it was an equally toasty day, and cranking up the air conditioner and digging into a few of these with spicy sriracha aioli was a pleasure. You’ll need vegan Worcestershire sauce for this recipe. Try Annie’s or Edward & Sons. If you want to add some extra oceany flavor to your cakes, try stirring some dulse flakes into the artichoke heart mixture. You can make the artichoke heart mixture up to two days ahead, and then just coat and fry them on the day of serving. The sriracha aioli will keep for 3-4 days in the refrigerator. You’ll need to soak cashews for 4-8 hours to make the sriracha aioli. Don’t worry if you forget though! As an alternative, just boil them for 15 minutes. 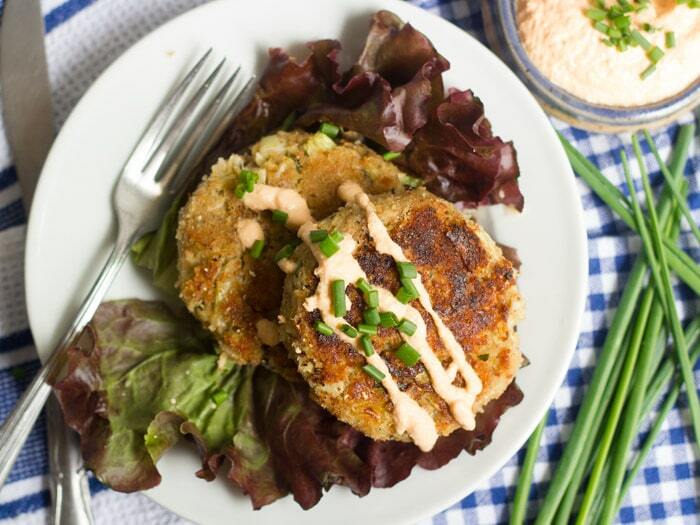 These melt-in-your-mouth vegan crab cakes are made with seasoned artichoke heart patties coated with crispy panko breadcrumbs, pan-fried until crisp, and served with spicy cashew-sriracha aioli. Place all ingredients into food processor bowl and blend until smooth, stopping to scrape down sides of bowl as needed. Season with salt to taste. Place artichoke hearts, celery, 1 cup panko, flour, garlic, chives, Worcestershire sauce and old bay seasoning into food processor bowl. Pulse until artichokes are finely chopped and ingredients are well-mixed, stopping to scrape down sides of bowl as needed. Keep the texture chunky and avoid overblending. Place the remaining cup of panko breadcrumbs into a small bowl. Line a plate with a few paper towels. Generously coat the bottom of a medium skillet with oil and place over medium heat. When the oil is hot, scoop up an eighth of the artichoke mixture and shape into a patty. Gently transfer the patty to the bowl filled with panko breadcrumbs and coat both sides. Carefully place the patty into skillet. Repeat, forming, coating and cooking another two or three patties (as many as you can fit into the skillet without overcrowding). Gently flip the patties, one at a time as they begin to brown on bottoms, cooking about 3 or 4 minutes on each side. Carefully remove patties from skillet as they are done, and transfer them to the paper towel-lined plate. Repeat until all of the artichoke mixture has been used, making a total of eight patties, and adding oil to the skillet between batches as needed. 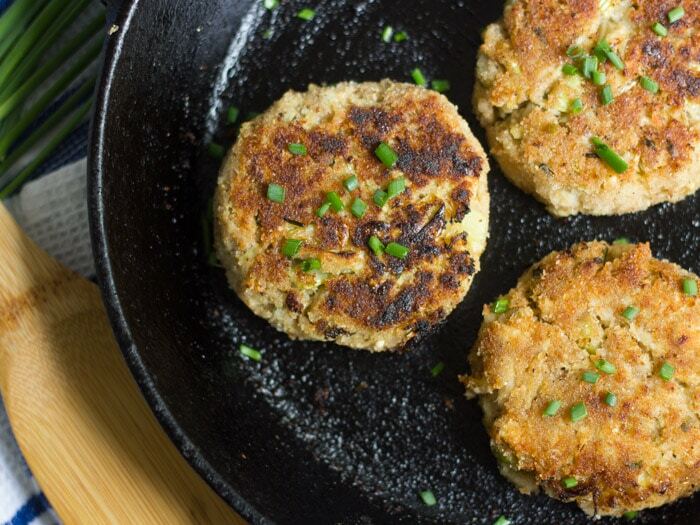 Divide lettuce leaves onto plates and top each with a vegan crab cake. Sprinkle with chives and serve with sriracha aioli. Prep time does not include soak time for the cashews. If you don't have time to soak them, boiling for 20-25 minutes will work in a pinch. The cakes should be moist enough for the panko breadcrumbs to stick to them. If you have trouble, try brushing them with a bit of non-dairy milk. You can, if you like, use the food processor to crush the panko breadcrumbs used for coating the cakes. This will give the coating a finer texture. It's nice, but by no means necessary, but adds yet another food processor step to the recipe, so it's totally your call if you want to expend the extra energy. Girl, girl, girl! These look so amazing. I love how you recreated a crab texture with artichoke hearts. I would have never thought to attempt a vegan crab cake. Genius. Thanks so much Annie! It was actually way easier than I ever anticipated! Oh yum! I love artichokes. 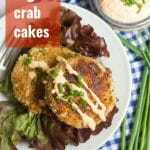 I’ve never tried crab cakes either but these sound delicious. Especially with that sriracha aioli. I’ve got all of the ingredients for that at home so I’m definitely going to have to give that a go. Awesome! I hope you enjoy them!! Okay Thanks. Made these last night and they are absolutely delicious. Great recipe. Because of allergies, made the aioli with Vegenaise, sriracha and lime. Worked well. Again, thanks for these recipe. Glad you enjoyed them! And Vegenaise sounds like a great swap for the aioli – thank you for sharing your results! What an amazing recipe! I can’t wait to try this, thank you. Loved the recipe! I actually baked them at 350 F for 50 minutes for a low-fat version. I used extra bread crumbs, too, to help it hold together. Turned out great. The sriracha aioli is a slam dunk! Thanks for posting this! I love artichokes! Oh nice! I always get a million questions on whether baking stuff like this works. Thanks for sharing your results and I’m glad to hear you enjoyed them! Yay! Glad you liked them! Thanks Christina! Wow, these were AMAZING! You could make these into poppers and serve them for a party, I couldn’t get over how well they held together and had the crab like texture. Thank you for posting such a great recipe! I planned to serve this for dinner this evening. I prepared the recipe as directed and fried up one as a sample and found the artichokes to taste very acidic. Otherwise, the flavor would be awesome. Any suggestions to mellow out the acidity? I saved the rest of the batch in the hopes it can be saved. I’m sorry to hear that! Normally I’d say add some sweetener to balance out the acidity, but be careful and just use a tiny bit if you do, becuase they could very quickly go to way to sweet. Another option would be to cut the mixture with something a bit more neutral, like some smashed chickpeas or cannellini beans. Could I use gf all purpose instead of whole wheat? I haven’t tried that, but I think it would work. Please let me know how it works out if you try! I just made these and I used gf flour. They turned out very nice. I used gf Panko as well. I’m glad to hear they turned out well! And thanks for all the info on your variations – I’ve actually had a few questions from people asking if these could be made gf or in the air fryer! Would frozen artichokes work ,that’s all I have ? Also have you tried using a small piece of nori to the mix? I think they’d work just fine! I haven’t tried this with nori, but I bet that would be a delicious addition. Enjoy!! Without having read the above comment I just made these today and I added 3 Nori sheets and dulse to the mixture, This gave it a more fishy taste which is great for seafood. I also added a drop of tamari, olive oil, and sesame seed oil to the aioli. This is a great recipe! Thanks!